This is my second post based on the report issued this week by Common Sense Media on VR. 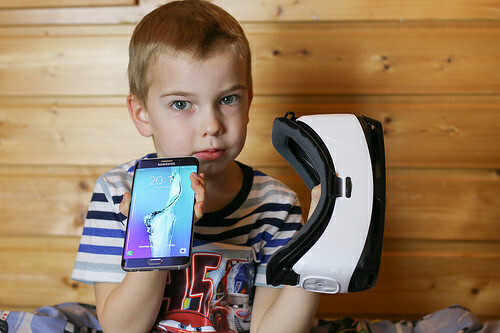 This post focuses on the challenges and opportunities of VR on childhood development. The development of the prefrontal cortex of the brain continues through to the mid-20s, bringing changes to working memory, impulse control and cognitive flexibility. The impact of VR on this development will depend on whether children can distinguish between actual and virtual experiences. VR's ability to block out the sensory experiences of the physical world can make it more challenging for young children to remember they are in the physical world while they simultaneously process the being in a virtual environment. In particular, children younger than 7 can face challenges discerning when virtual events are not real - studies have shown that in elementary children this can lead to a high rate of false memories. This is not the case when children watch TV or play video games as they are aware that events happen to screen characters and not to themselves, but because of the immersive nature of VR this may not be the case, as it feels like a real experience. Studies have been done on sensory and vision effects of VR, though these have been small scale and the researchers have warned that the long-term effects of VR are unknown. The mismatch between 3D images on 2D screens can cause headaches and eyestrain, and there is concern that this might have long-term impacts on young children because their developing brains make them more susceptible to these disruptive pressures. There is already a large body of research over the past 30 years about the connection between aggressive behaviour and violent video games, as well as decreases in prosocial behaviour, empathy and sensitivity to aggression. Young adults who play violent video games using VR report more aggressive feelings and they experience elevated heart rates compared to those who play the same game on a computer. Young adults also play the VR games more violently than on a desktop. Another study showed that the psychological pressures generated during violent VR games increased the level of anger they felt after playing them. This is clearly an area of concern for families. There are also some benefits to education, for example "reverse field trips" where students can virtually visit places, events and times. When comparing the learning outcomes from VR versus video or desktop games, however, the evidence shows that VR fails to results in an increased retention of facts and there is little transfer of knowledge to new situations. Finally whereas violent video games are associated with aggression, research has shown that prosocial video games can be associated with positive social outcomes such as helping behaviours. Experiencing a virtual encounter while "walking in someone else's shoes" can be a powerful experience. At ASB we have explored VR for virtual fieldtrips and have incorporated it into some science lessons. Generally, though I've explored this quite extensively, there is little content out there that directly matches with our units and learning outcomes. I'm also skeptical of the "pre-packaged" narratives which are not always relevant to our students' inquiries. the questions remains - will VR be a game changer in education, or will it go the way of other innovations such as interactive whiteboards and devices such as Google Glass?